Notes | Filled with inspiring stories, insightful interviews, and stunning color photography from Pulitzer Prize-winning photographer Rick Rickman, this incredible book showcases the unique power and grace of today's senior athletes. Spanning a broad spectrum of sports, the profiles inside paint an intimate portrait of senior swimmers, runners, and others who continue to compete well into their later years. Also including an in-depth look at the spirited and increasingly popular U.S. Senior Games, The Wonder Years triumphs over the conventional wisdom that growing older means slowing down. 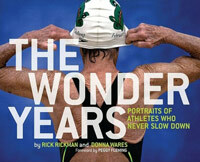 Rick Rickman is a Pulitzer Prize-winning photojournalist and the official photographer of the Senior Games. He lives in Southern California. Comments | [12/30/09] This is a wonderful book that is so special because Rick Rickman spent 20 years documenting this subject. The Wonder Years is truly a labor of love and the folks at Chronicle Books did a wonderful job of putting this book together. It is always fun when a photographer like Rickman can see the end results of a project like this and get his subjects so much exposure. Nice going Rick! Comments | [07/24/09] Great book about a topic that I have been interested in for years!! !